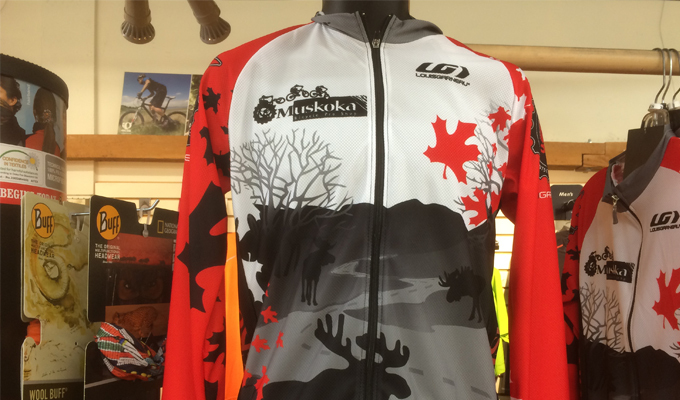 Muskoka Bicycle Pro Shop had their own customized jersey designed by shop owner Caroline van den Bulk. Featuring some of Muskoka’s most popular scenery, symbols, and animals, it truly resembles the beautiful area we live in! We can also ship this jersey internationally for those who didn’t quite get the chance to purchase their souvenir! While you are shopping for a jersey, check out our Muskoka Bicycle Buff headgear and socks too!